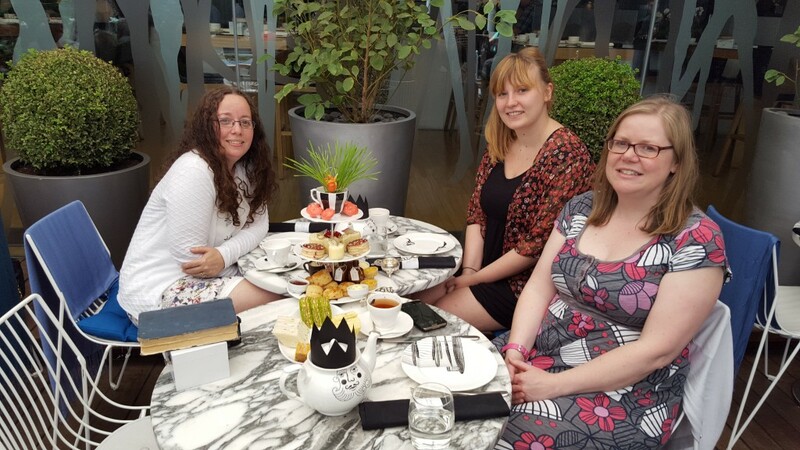 The first point on my #25Before25 mission is to have afternoon tea somewhere posh – and after devouring this incredible Alice in Wonderland-inspired afternoon tea at the 5* Sanderson Hotel in London, I can consider this one well and truly ticked off! 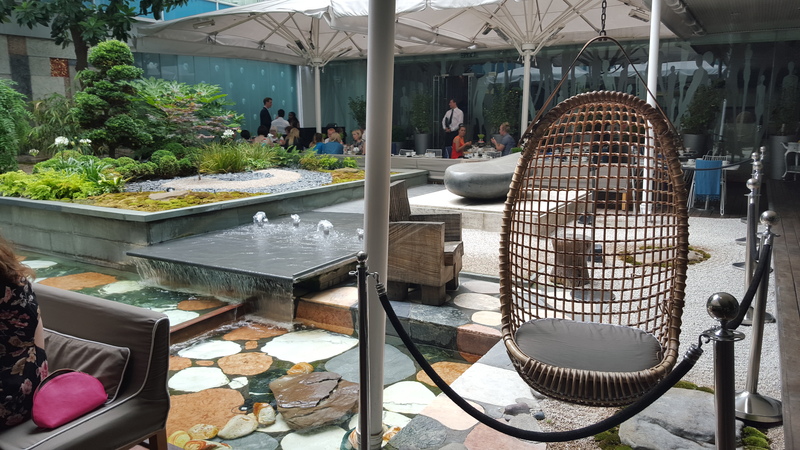 My visit to the Sanderson Hotel was as part of a blogger summer meet-up with the lovely Natasha from TraveladdictUK and Colette from Armchair to Reality. 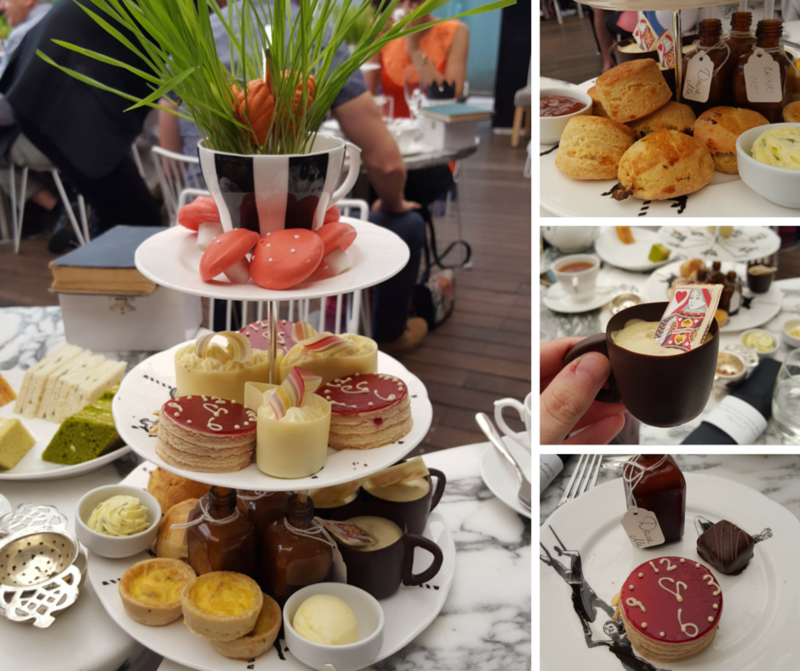 As it’s the 100th year anniversary of Alice in Wonderland this year, we felt the Mad Hatter’s Afternoon Tea was an absolute must. Themed afternoon teas appear to be particular in vogue in London at the moment. And if my experience of them has taught me anything (like that time I had a Charlie and the Chocolate Factory-themed afternoon tea at One Aldwych) it’s to go on an empty stomach. These teas love to go above-and-beyond the usual ‘scones/sandwich/cake/tea’ concoction, so you’ll need every spare inch of stomach. True to form, the Mad Hatter’s Afternoon Tea was no exception. I don’t think I ate for at least six hours after our sitting. 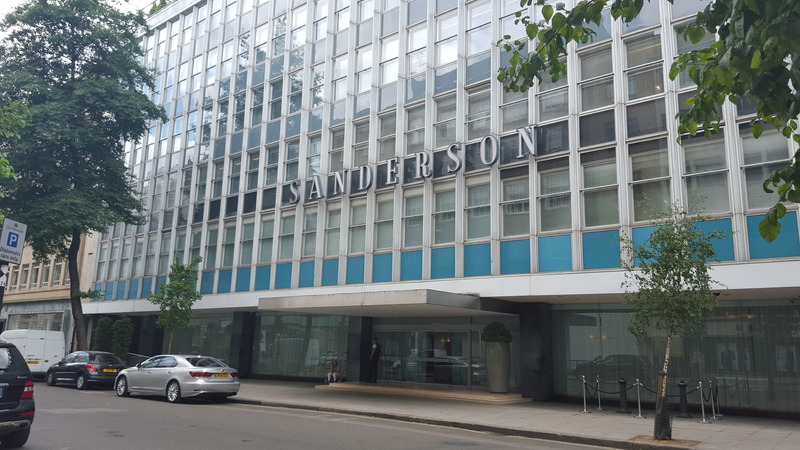 For a 5* hotel in the heart of London, the Sanderston Hotel sure isn’t pretty. In fact, it reminds me of my old university tower block which was built in the 1970s. Inside it’s hit by a towering wave of modern design, with a red sofa in the shape of lips and hanging chairs like something out of the ’60s. Thankfully as it was a royally nice summer’s day we were able to sit out in the courtyard under the shaded shelter of the umbrellas. As you can imagine with an afternoon tea this expensive (£38 before you even add a glass of Prosecco), everything’s been well thought-out and is displayed to perfection. 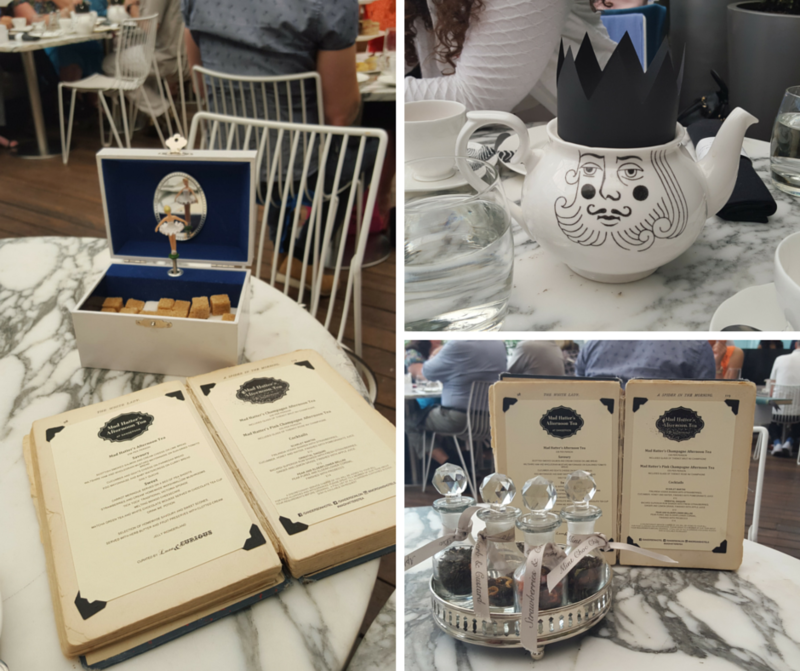 Everything revolves around the Alice in Wonderland theme, from the King and Queen of Hearts on the teapots to the riddles printed out onto the napkin holder. The whole menu is even printed in an old book, while sugar cubes are huddled together in a musical box – could it get any cuter?! The food itself was brought over on a three-tiered cake stand which was pretty much packed with just all the sweets. Definitely an afternoon tea sight to behold, but I definitely would have preferred a few more savoury items (especially since I could only eat half of the sandwiches brought out because I’m a vegetarian!). However, the mini quiches were a nice touch. Looks pretty hefty, doesn’t it? Those with a ‘*’ next to them weren’t suitable for vegetarians, but I was supplied with a veggie alternative. Also, I could only really eat one of the jellies, but it tasted like thick jam anyway, so I wasn’t too bothered. I’ve heard so many good things about this tea, and I’ve got to say it’s definitely won me over. It would be ideal for a special occasion or Alice-enthusiast (especially if you decided to push the boat out and add a cocktail or glass of champagne to it), but make sure you pack your sweet tooth when you go down the rabbit hole. You’ll need it. Great time was had by all three of us – can’t wait to catch up in November – just a shame it will probably not be as nice as this was ! I’ve heard so many great things about this tea and I love the garden section in the Sanderson. Looks like good fun! You know I love a good afternoon tea and this looks awesome. I’ll definitely have to check it out when i’m back in London. I was at the Sanderson recently in their penthouse for a photo workshop and I’d love to return to try their tea. The king teapot is just too cute! LOVE THIS!! I am traveling to London on the last leg of a four city European holiday with my 9 year old daughter in April. I heard that this was a fun place to take her, but after reading your thoughts and experience, I’m more excited than ever to bring her to the Sanderson. Your photos are lovely!